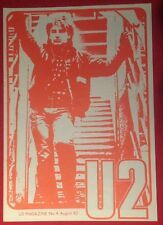 U2 lithograph. Condition is Like New. 690mm x 970mm This is a proof and is not numbered. U2 CITY OF BLINDING LIGHTS LIMITED EDITION COLLECTOR'S WALLET. THIS WAS GIVEN AWAY FREE BY U2's FAN CLUB AND THEN YOU HAD TO COLLECT THE CDS ! CD CASE ARE NOT GRADED AND SHOULD NOT HAVE ANY MORE THAN SCUFFS AND A FEW SCRATCHES. 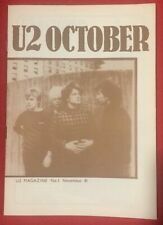 This Fanzine was obtained by my brother in law who attended many U-2 gigs in both England and Ireland., and just as certain you’ll be hard pressed to find another????. 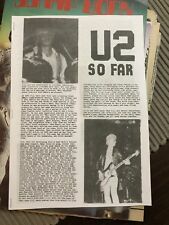 The fanzine is from his scrap book which contains lots of clippings, a Christmas card, ticket stubs, original photos taken by him, press office correspondence, autographs and set lists. U2 ALL BECAUSE OF YOU LIMITED EDITION COLLECTOR'S WALLET. THIS WAS GIVEN AWAY FREE BY U2's FAN CLUB AND THEN YOU HAD TO COLLECT THE CDS ! CD CASE ARE NOT GRADED AND SHOULD NOT HAVE ANY MORE THAN SCUFFS AND A FEW SCRATCHES. U2 Propaganda World Service Magazines Issues 4,5,6 & 2x Uncut specials & Vox magazine please see pictures for details Also includes a series of colour and Black and white prints . Condition is Very Good Dispatched with Royal Mail 2nd Class. 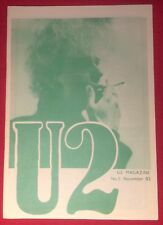 THIS WAS GIVEN AWAY FREE BY U2's FAN CLUB AND THEN YOU HAD TO COLLECT THE 7" VINYLS ! VERY RARE U2NO LINE ON THE HORIZON LIMITED EDITION COLLECTOR'S BOX. IT WAS SUPPOSED TO CONTAIN FOUR SINGLES PRODUCED FROM THE ALBUM BUT ONLY THREE WERE EVER RELEASED ! U2 Propaganda - Issue 02 Volume 02 - Winter 2000 (U2 Fanclub Magazine) U2 Fanclub Magazine - “Propaganda” only issued to paying U2 Fan club members. This copy is in excellent condition. Check out my other listings for other issues I am selling. I am happy to agree a combined postal fee if you buy/win multiple issues. Thanks for looking and Happy Bidding! THIS WAS GIVEN AWAY FREE BY U2's FAN CLUB AND THEN YOU HAD TO COLLECT THE CDS ! THIS WAS GIVEN AWAY FREE BY U2's FAN CLUB AND THEN YOU HAD TO COLLECT THE CDS ! CD CASE ARE NOT GRADED AND SHOULD NOT HAVE ANY MORE THAN SCUFFS AND A FEW SCRATCHES. 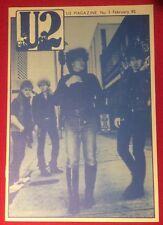 U2 Propaganda - Jubilee 2000 Issue - Special Edition - Very Rare with Printing Spelling Mistake (U2 Fanclub Magazine) U2 Fanclub Magazine - “Propaganda” only issued to paying U2 Fan club members. This copy is in excellent condition. (Except the genuine spelling mistake!) Check out my other listings for other issues I am selling. I am happy to agree a combined postal fee if you buy/win multiple issues. Thanks for looking and Happy Bidding! U2 Propaganda - Issue 20 Summer/Autumn1994 (U2 Fanclub Magazine) U2 Fanclub Magazine - “Propaganda” only issued to paying U2 Fan club members. This copy is in good condition, with only a slight bend on the top right corner of the front cover. Check out my other listings for other issues I am selling. I am happy to agree a combined postal fee if you buy/win multiple issues. Thanks for looking and Happy Bidding! U2 Propaganda - Issue 25 - Winter 1997 (U2 Fanclub Magazine) U2 Fanclub Magazine - “Propaganda” only issued to paying U2 Fan club members. This copy is in excellent condition. Check out my other listings for other issues I am selling. I am happy to agree a combined postal fee if you buy/win multiple issues. Thanks for looking and Happy Bidding! U2 Propaganda - Issue 26 - Spring/Summer 1997 (U2 Fanclub Magazine) U2 Fanclub Magazine - “Propaganda” only issued to paying U2 Fan club members. This copy is in excellent condition. Check out my other listings for other issues I am selling. I am happy to agree a combined postal fee if you buy/win multiple issues. Thanks for looking and Happy Bidding! U2 Propaganda - Issue 27 - Winter 1997 (U2 Fanclub Magazine) U2 Fanclub Magazine - “Propaganda” only issued to paying U2 Fan club members. This copy is in excellent condition. Check out my other listings for other issues I am selling. I am happy to agree a combined postal fee if you buy/win multiple issues. Thanks for looking and Happy Bidding! U2 Propaganda - Issue 19 Spring/Summer 1994 (U2 Fanclub Magazine) U2 Fanclub Magazine - “Propaganda” only issued to paying U2 Fan club members. This copy is in ok condition, a little worn and “dog eared” on the right opening edge and by the lower staple & corner. Check out my other listings for other issues I am selling. I am happy to agree a combined postal fee if you buy/win multiple issues. Thanks for looking and Happy Bidding! U2 ELECTRIC STORM LIMITED EDITION COLLECTOR'S WALLET. THIS WAS GIVEN AWAY FREE BY U2's FAN CLUB AND THEN YOU HAD TO COLLECT THE CDS ! SOUVENIR "FOTO FILE" . titled U2 ENDLESS FIRE MAGIC MUSIC, written by Chris Donovan and Brian Perkins, and published by Pipeline Promotions Ltd., Redhill, Surrey (1988). A4 format. Glossy paper binding as shown in our scan.